Throughout the house I have assorted pottery bowls. I love pottery bowls, but really, one family can only use so many. 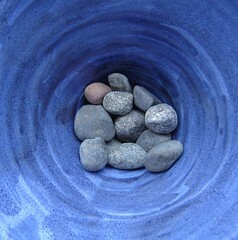 So I’ve started putting my rock collection (yes, adults can have them too) in the bowls. The rocks are from various outings and adventures and the bowls are usually suited in some way to the memories. Sometimes there are seashells mixed in. Occasionally small bits of dritwood weasel they way into the collections. This bowl was made by Christina Dove of Dove Pottery and contains pebbles from Garden Cove on Exploits Islands in Notre Dame Bay, Newfoundland. I spent my summers there as a child and get back whenever I can. The blue is just right…..
Next Post More possibilities with foam, glue and paint….